I think the word is out: daisy-chain straps are a great option for hammocks. 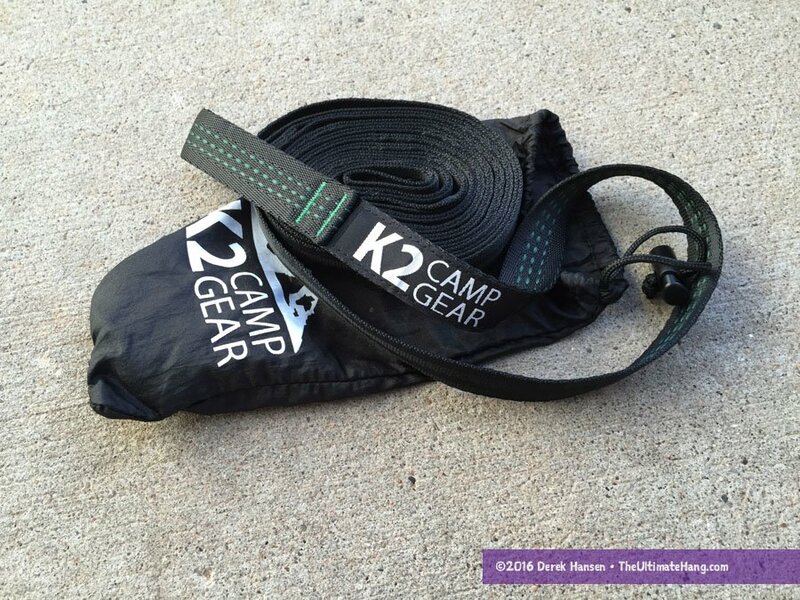 The K2 Camp Gear straps are one of a dozen now in the market. The K2 straps are a cross between the flat daisy chain design that was first debuted by Kammok and the heavy-duty webbing from ENO. The construction is solid, although K2 only uses two lines of stitching where others use three or more. Still, it is safety rated for 200 lbs (91 kg), which is common for most straps of this design. Each strap has a total of 15 loops that begin a few feet from the anchor end. The anchor side is 4 ft (122 cm) long and doesn’t have any loops except for the end loop. The K2 strap set uses colored tracers to provide some individually to the straps. I’ll be honest: I wasn’t expecting much from the K2 brand. It is a bandwagon brand like dozens of others that have sprung up in the last few years to take advantage of the burgeoning hammock market. However, the straps I was sent to review are solid. These aren’t cheap polyester straps that I’ve seen spring up on Amazon.com. The webbing is thick and robust with a seatbelt-style cross weave. In appearance, it comes head-to-head with the more established brands. The flat construction means the straps are less bulky than the open loop design from ENO, so they pack smaller and are easier to handle. I highly recommend daisy chain webbing straps for beginners because they are so easy to master and are hard to mess up. Construction and Craftsmanship ♥ ♥ ♥ ♥ ♥ These are solid straps with excellent construction. No loose threads. I wish the loops had triple-stitching. Modularity and Adjustability ♥ ♥ ♥ ♥ ♥ Lots of adjustability and use with daisy chain straps. Aesthetics ♥ ♥ ♥ ♥ ♥ The color tracers are a nice touch, but it isn’t a huge differentiator. Reflective tracers would be a nice touch. Price and Value ♥ ♥ ♥ ♥ ♥ Buy direct from K2 Camp Gear for the best price ($20), which is a good deal for a pair of daisy chain straps.